Two weeks ago, we heard the story of little Addie, a chronically ill 6-year-old girl who may be celebrating her last Christmas this year. 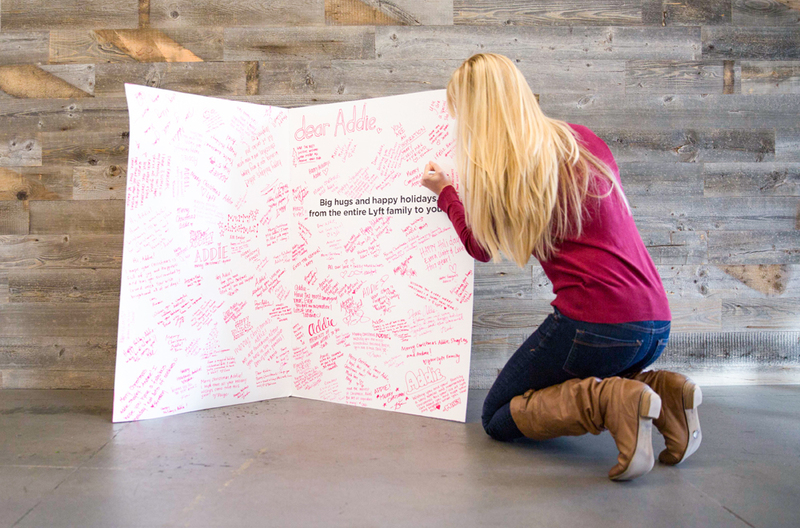 Inspired by her family’s wish to give Addie “a lifetime of Christmas cards,” the Lyft community mobilized to send nearly 3,500 cards. Across the country, Lyft drivers turned their cars into card-writing stations on wheels, while passengers filled out cards during rides and spread the word on social media. Together, the community generated 3,492 cards, all made special with personal touches ranging from emojis to artwork to gifts. Highlights include glittery gingerbread men, inspiring wisdom from a breast cancer survivor, and handmade bracelets (with very colorful instructions). Big thanks to everyone who participated and made this holiday such an inspiring one. From all of us here at Lyft, happy holidays!